Night in the Lonesome October was the first Richard Laymon novel I ever read. I’d read his short story collection, Dreadful Tales, I’d loved it and I’d wanted to read more. So I read Night in the Lonesome October and I just couldn’t put it down. After that I was hooked on Laymon’s work. In fact, the book made such a big impression on me that I have just read it again. It was just as good the second time around and I am sure that it will not be the last time that I read this book. The main character in the book is 20-year-old Ed Logan. Ed is a student at Willmington University and he has just been dumped by his girlfriend, Holly. Holly doesn’t return to Willmington for the fall semester and then two weeks later Ed gets a ‘Dear Ed’ letter informing him that she has met someone else. Of Course, Ed is devastated by the news and ends up consoling himself with vodka. Fortunately for Ed the letter comes on a Friday and he has all weekend to recover from his hangover. On Monday Ed goes to class as normal and, on the evening, studies until eleven o’clock, but can’t keep his mind on his work and so goes out walking. And that is where his adventures begin. While he is walking Ed bumps into Holly’s friend, Eileen, who seems very sympathetic towards him. When Eileen asks Ed where he is going he tells her he is going to walk to Dandi Donuts. Eileen is surprised at this because Dandi’s is a seven-mile hike. She offers to walk with him, but Ed says that he would rather be alone. Understanding this Eileen doesn’t push the matter, but asks Ed to bring her back a couple of donuts. Ed agrees and sets off walking. As he walks Ed sights a girl walking. She is young and attractive and he wonders why she is out so late and where she is going. On the spur of the moment he follows her for a while, watching her ponytail bouncing, and growing more intrigued with every step. When he loses sight of the girl, Ed continues to the donut shop. This nocturnal quest for donuts proves not to be just a one off, and he finds himself walking the night-time streets on a regular basis, only now he is more interested in finding the mysterious young girl than he is in donuts. Long before he finds the girl, though, Ed discovers that the town is a very different world at night and half the people that he meets are weirdoes. A lot of them dangerous weirdos. I think the reason that I like Night in the Lonesome October so much is that Laymon makes the night-time Willmington seem not just dangerous, but almost magical, and I can identify with the idea that the town is a different world at night. I work a lot of nightshifts myself and most places seem very different on the wrong side of midnight. Night in the Lonesome October has romance, humour and intrigue running (or should that be walking) alongside the horror, and it is incredibly well written and has some the best characters that I have ever encountered on the written page. 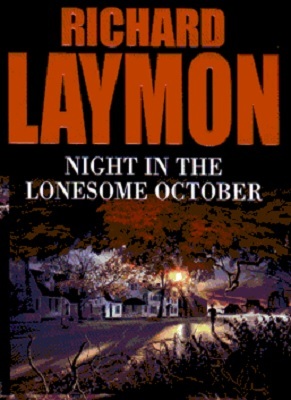 If it was Dreadful Tales that got me interested in Laymon’s work, it was Night in the Lonesome October that made me a fan. Four years after first reading it, I am still a fan and will still be a fan in another four years time.